Updated Post For Earth Day 2019: The current economic climate has many people anxiously asking “how do we prepare students for the modern workforce?” This is not an easy question to answer. There are those who believe that immersion in technology is the answer! And there are those who are advocating for bringing back education in the trades. Mike Rowe, of Dirty Jobs fame, is perhaps the most prominent voice calling attention to the value of traditional trade craft. Check out his latest initiative here. Perhaps the next big question in the education sphere should be; “how do we raise healthy children?” This would certainly be an appropriate question to ask considering the rise in childhood obesity, attention deficit disorders, depression, anxiety, and many other troubling conditions plaguing young people. How to prepare students for the modern workforce and how to raise healthy children are both vitally important questions that demand thoughtful consideration and answers. Popular responses to these questions covered in main-stream education news tend to focus on Common Core Standards, school choice, technology in the classroom, and school safety. 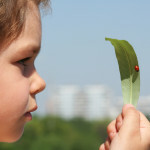 Rarely, do big news networks run stories focusing on the connection between time in nature and the health of children, but perhaps they should. Often, it is local news papers and news networks that produce stories like this one, shedding light on the importance of time in nature and the connection to health and overall wellbeing. Spoiler Alert: If you just watched the news story, a lot of what you are about to read will sound familiar, but that’s ok! In fact, you should watch the news report again because it is so full of great news and information and you should still continue reading of course. The news report also tells me that we have made a lot of progress since I first wrote this article several years ago and that makes me really happy. However, there is still a lot of work to do to in helping others understand the value of nature and its connection to health. Unfortunately all the evidence in the world won’t change some people’s thinking unless it affects their bottom line in terms of dollars and cents. These individuals should consider the negative financial impact of both an unskilled workforce and an unhealthy population. If you’re a business owner that provides healthcare insurance and is troubled by the rise in cost you probably would be interested in ways to save money. What if there was a simple solution to all of these dire problems? “Imagine a treatment that would improve your mood, make you smarter, keep you healthier and improve your relationships. How much would you invest in that therapy? It turns out there is such a thing, and best of all, it’s free. It’s called “nature.”(Rosen Lawrence, MD) This quote came from Rx Nature and it is a good starting point in looking into the positive impact of free outdoor play on children’s overall health. 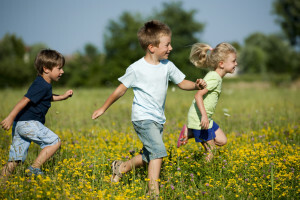 From there you can access the reports from The American Academy of Pediatrics as well as other research studies that highlight the free play, nature, and health connection. Richard Louv, best-selling author of Last Child in the Woods, the Nature Principal, and Vitamin N is a leading advocate for children spending more time in nature and for unstructured free play. (He should be familiar already if you watched the above news story) Unstructured free play in nature is the simple and free remedy to a phenomenon he labeled “Nature-Deficit Disorder.” In short, Louv described a modern condition with many symptoms all derived from our disconnection to the natural world. There has been a great deal of research and scholarly papers written on the subject of Nature Deficit Disorder since the publication of Last Child In the Woods in 2005. You can visit this link to view some of them. For additional health benefits of time in nature and free play check out this site. Some Health Care professionals have made the connection as well and are beginning to prescribe a dose of nature for some of their patients. Read about it here. This trend is more poplar in the UK and Canada, but it is finding its way to the United States. Click here to read about a mother from Washington State and her treatment for anxiety. It also turns out that parents around the world agree that children need nature! The Nature Conservancy and Disney implemented a world-wide survey and compiled their research findings into a great info graphic that you can view here. As a teacher you may be saying, “This is all great, but how will I find any extra time for free play and nature?” It’s true, public school teachers are facing so many challenging demands as it is. It is also true that teachers are fighting back and are taking a stand against policies that they feel are unjust and detrimental to their student’s success and well-being. If teachers see the value in free play and more time in nature, they will find a way to implement incremental change. Even if it means a five-minute walk outside or teaching math with pinecones under a tree. Small change is still change! For some great resources check out this link. Teachers also have numerous points of reference to draw upon when making a case for adjusting their curriculum and school policies. Take Finland for example. There has been a bit of attention lately on how Finland educates their children and treats their teachers. It is in fairly stark contrast to the prevailing trends in US education. In short, children play more, teachers teach less, and are valued more. I know that was far too simple of a critique of the Finnish educational system, but time is short. To learn more about the subject, check out these links from the Smithsonian and This is Finland. You don’t have to travel to Finland to find alternative forms of education to draw upon or even pursue. Right here in the USA there are over a hundred Waldorf private schools and numerous Waldorf charters. Waldorf education believes in educating the whole child in a manner that involves their thinking, feeling, and doing, often referred to as a head, heart, and hand approach. An emphasis on story, art, movement, and time spent in nature in unstructured free play are staples of Waldorf education in the early grades. There are also many charter schools that offer students an experiential education model with a strong focus on hands on exploration. The Ridge and Valley Charter School in Blairstown NJ is one such example. I offer this blog with the hope of getting teachers and others involved in education talking about nature and free play and their potential benefits on the health of children, academics, and on the economy. After all, a child with a healthy body, mind, and spirit is more likely to become an adult who is a positive contributor to his/her community, place of work and to the world. Are you a teacher? Do you find ways to get your students outside? Do you have thoughts on what you just read? We would love to hear from you! Please share your thoughts and comments below.